Influences - "Drums in his Heart"
There are five I always refer to. This does not mean many others have not also inspired and influenced me as a person and as a drummer. I have read interviews with drummers whose playing may not have struck an intimate chord in me, but whose expressed thoughts really hit home and further expanded my mind towards the instrument. I think back to a personal 'dry' period and reading interviews with Peter Erskine, Jack DeJohnette, and Pierre Favre'. Drumming, to me, is as as much thought as it is physical expression. As a kid, so far over my head, but one cannot help but be impressed with his absolute, complete mastery and control over the instrument. I've never really been into Big Band music that much, but to take the time to watch and/or listen to Buddy is always a learning, and humbling experience. Swingin' New Big Band and Big Swing Face. It's like I played them to torture myself. West Side Story became the mark for me. There's a snare solo I remember on The Monster which made a deep impression on me first time I heard it as a young player. The control he had, at any speed, is awe inspiring. I do not believe it has ever been duplicated in his style of playing. An incredible left hand. It moved as though it had its own brain controlling it. As much as he sweat while playing you always knew it was because of body chemistry and hot lights, not because he worked at what he was doing. He made everything look effortless. I remember a television special of Buddy's band Live at Wolftrap. Toward the end of his solo the camera closes in on his face and there's this drop of perspiration just hanging on the end of his nose. He's doing his patent whisper roll across the head, onto the hoop and back to the head building into a final flurry, when that drop of sweat flew off his nose and you could not see his hands. Just a blur. All you can do is shake your head. His intensity, his fire, his fun. How can Buddy Rich NOT be an influence in some way? Because Buddy was so far over my head as a young kid, the door was open for someone more down to earth, and that was Baker. He has said that others play faster than him, or play more technically proficient, but nobody plays like him, and that is the truth. When you hear Baker, you know it's him, and that principle was ingrained in me at a very young age. Be yourself. Find your own voice. 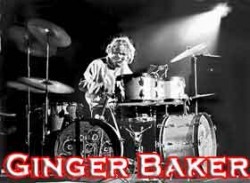 With Ginger it was the big set, all the double tiered cymbals, all the percussion he played on albums, hearkening back to jazz drummers a generation before him. It's also easy to see how Sam Woodyard was an influence upon him. The art of drum soloing, constructing a solo. Major influence upon me. Speed. Coordination. Stamina. Intelligence. Technique. Raised the bar for me in a big way. The symphonic influence again, as Baker had, with tymps, gongs, bells, etc. Soloing. Just a machine in a solo. And quite an entertainer, as well, borrowing, again, from a generation before him. One can see the influence of Buddy Rich in his playing. I remember walking into the New Haven Civic Center and seeing that stainless steel drum set for the first time. Talk about drum candy. I'd love to meet him some day. He seems like a real nice guy. So, it's late one night and I hear this sound on FM. It's the Mahavishnu Orchestra. Startling enough as the music was the complete firestorm ignited by Billy Cobham was mind blowing for me. "What was THAT!" So, when I found out the name of the group I immediately went out and got The Inner Mounting Flame. This was drumming so radical as to make one just stop and try to figure out what was happening. You couldn't casually listen to this man play. You had to digest this feast. Then I saw him live on In Concert. Clear Fibes. What? He plays left hand lead. All this left hand and right hand crash punctuation. Thunderous speed around the toms. The incessant rudiments in delivery of fills. This is power and force never heard in modern music. The guy is like a cobra on steroids. The technique of his strikes. The fluidity, yet, it seemed bound up in a spring that snaps in fury. He changed the world of drumming like no one else in the latter 20th century and it is unbelievable how many drummers don't even know who he is. The bar is raised again, and Cobham becomes another microscope sample. He changed the way I saw drumming. He opened my mind on how to approach a set of drums. From Rock, to Progressive, to Fusion the influences of the genres as much impressed upon me a way to approach drums as much as the drummers. Classical music influenced me. Drum corps, while I never participated, had a major influence upon my playing. But at 38 years old I was re-introduced to Tony Williams. I had his fusion albums, but rarely listened to them, mostly because I was not too into Allan Holdsworth's 'sound', I suppose. But, when someone gave me a video of Williams' work in a straight jazz setting I was greatly moved. I had said to this gentleman, "I have heard so many drummers. I'd like to hear someone who is different." "You'll enjoy this," he replied. He was right. Tony's playing, his soloing is true language on the drums. It's orchestrated passion, technique, and authority. The combination of power and finesse is breathtaking and mesmerizing. So then I go back and really listen to Lifetime records and I "hear" them, whereas I had not before. I've also been influenced by things Tony has said in interviews. And to understand the influence of Max Roach upon Tony Williams creates another influence and graphically shows the progression, generation to generation. It led me to create a solo, which I call, simply - Thanks, Max. Thanks, Tony. 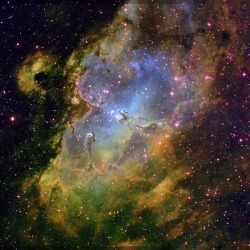 Pictured is the awe-inspiring Eagle nebulae, containing the well known "Pillars of Creation." This area in space is so many trillions of miles wide and deep it staggers the imagination, yet it is but a dot in the universe. One might wonder how God can be an influence on my drumming, but such is well understood by those who have a living connection to their Creator. From the trees He created, to the wood from the trees which makes the drum shell, to the beautiful grains of wood veneer to cover the drums, I see the Creator. To be a new creation in Christ brings with it a vital awareness which must enter everything one does. After I became a Christian my tastes changed, my life outlook, my view of the world, and of the future. All these things influence how I play. God enters the mind, the mind then functions on a different track than before. You think differently, more acute, more detailed, with more passion and confidence and this has to effect what one does, especially a musician, who is framing things from both left and right brain. In some ways, in many ways, my Creator has influenced me more than all those drummers who have done so put together. The reason for playing becomes for the "audience of One," for the instrument, for the sound, for the development of talent given by the Creator to glorify Him, not man. So, really, God has become my main influence. There have, obviously, been other drummers who have made an impression upon me in one way or another, like all of us, even if their craftsmanship hasn't outright effected my own approach to the instrument. I just enjoy watching any drummer do their thing, and one trip to youtube will show anyone just how many unbelievably talented drummers there are in this big world, some of whom no one really knows, but they shine nonetheless. These are some of the players who have inspired me with their "Voice" and their performances. Max, Elvin, Art, Papa Jo, Charli Persip, Sonny Payne, Shelly Manne, Alan Dawson and others, when I hear and have seen these greats, though not a great jazz listener myself, I have been impressed by their individual voices and talents. Some of these guys just soared into the stratosphere. Dino Danelli. Call him a pop drummer, but this guy had a lot of imagination and speed as displayed on 'Freedom Suite.' As a young kid that really 'hit' me. Ian Paice. Seeing him live was a treat because he exuded a professional 'ease' to his playing. He just kind of flowed at everything he did. 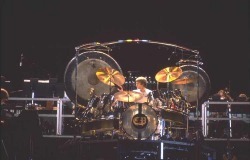 Bill Bruford. Always innovative, always re-inventing himself. Just an enjoyable drumming mind. Definitely on the edge (pun intended). Mike Clark. Just a real drummist and innovator. A true Time Manipulator. Great soloist. Curt Cress. His work with Passport always impressed me. I liked his style and his sound. He also had a stint with Triumvirat. Lenny White. Another master of calm, with some cool grooves happening all the time. Narada Michael Walden. Outside of the Mahavishnu Orchestra I probably would never have heard of him, but his whole approach to the set was very inspiring. He sounded different, which always impressed me. Rayford Griffin. Just a very dynamic, intelligent player. Always 'said' something to me. Terrific technique. Gerry Brown. Another guy who just impresses me as a great drummer, an unsung hero of the day. And he was doing stick tricks way before it became 'the thing' to do. Gary Novak. Just a fabulous drummer; a powerhouse articulator. Steve Smith. Sharp, clean, deliberate; a master. I've followed him from his early days with JLP when I saw him live and thought he was the drum tech come out for a sound check! Big surprise. I look at Buddy, Alan Dawson, Joe Morello and others as true masters of the instrument in their day (and Morello just kept on going). If someone asked me who I thought was THE master of drum set playing in our day it would have to be Steve Smith. Has anyone studied the instrument more, or advanced more year to year in their own skills and understanding of the instrument? No one I know of. There are lots of masters on the instrument. Steve Smith seems, to me, the preeminent player in this generation. Some may play faster. Some may have equal technique, some have more "tricks" to display, but overall, Smith has carved a place as active historian/player that is unmatched at present, imho. Roy Burns. I always appreciated his thoughts in his columns, but never actually saw or heard him play. I remember the old Rogers drum ads. But when I saw him on a Modern Drummer video, it all made sense. The man is clean, articulate, and fast and just a great drummer. I was duly impressed. I also saw him on a youtube video. Man, he is good. Simon Phillips. Some have said he is like a younger Billy Cobham. I disagree. Aside from the open-handed style, his approach to the set is his own, and he has his own voice, and has provided the drumming world with some seriously inventive playing. Dom Famularo. C'mon this guy is just plain great. Fun to watch. A real stylist. Great technique as well. I love him. Lee Pearson. I place him here because his enthusiasm reminds me of Dom, he is incredibly fun to watch, and his chops are serious, man. This cat can play. I just came upon him on youtube watching a Spyro Gyra concert. Had never heard of him. His name will be a big one. Chad Wackerman. I like his sound, his style, his technique. Just a wonderful player. Seems like such a humble guy, too. Dennis Chambers. The Octopus. Being this talented is difficult not to be impressed by. I saw him in a clinic in Nashville. Odd, he didn't seem as fast in person. But hey, warp 5, warp 10, it's all relative. Will Kennedy. Great snare sound, fun to watch and listen to. He's a wonderful drummer. Dave Weckl. Wonderful craftsman. Some of the nicest soloing work that I have been exposed to. Virgil Donati. Perhaps THE most individual and recognizable voice at the instrument ever. I mean, ever. Virg does things no one did before him, and the clones can only say they got it from him. He is the master of mathematics at the set. A drumming physicist of relentless talent and ability. Trilok Gurtu. In many ways this man could be number 6 for me. I really enjoy watching and listening to him play his unique set-up in his totally unique way, which inspired me to make my 'pancake' drums, and also to do a tribute solo to him on the TrapKat dvd. His technique is sterling and unique to the instrument. When you hear him, you know it is him, his instrument, his voice, his presence. THAT is what drumming is all about to me. Benny Greb. For the new players out there he is just too cool. He makes it all look so easy, and does some outrageous stuff. To that end, I have always loved drum "battles," or duos, trios, quads, whatever, and found them very inspiring. Glen Velez. No, he's not a set player, but what he can do with fingers is very inspiring to me. A true master of hand drumming. Gergo Borlai. I discovered this fantastic drummer by accident. In a word, a "monster" player. Guys like this just make you want to jump behind the set and play. His speeds are unreal. His control, definitive. Damien Schmitt. Is there anything he cannot do? Anything from behind a set of drums? Any style? Any technique? Any trick? This guy is just a master, period. Can Drumming Keep You Young?